I suppose I haven’t mentioned people much in the last few days. I believe there are more foreigners than Americans in southern Utah. Germans, French, and Japanese seem to be most drawn to the natural wonders of the world. If I had to guess, several travel agents sell a package to the Grand Canyon and the National Parks in Utah. I also met a few fellow Texans from the Austin area at Calf Creek Recreation Area. They opted not to take the whole hike to the falls, which was probably a good choice. They were on a three-month sabbatical with their ultimate destination being Alaska, so I’m certain they will find more falls while on their journey. I ran into them again in Bryce, some sixty miles away and a day later! They commented that yesterday was the first hot day in the area and they simply felt tuckered out. I agreed. Being Texans we all laughed that a dry eighty degree day felt like a sauna to us. It is just an amazing reminder of how bodies adjust to conditions over time. This morning I backtracked twenty miles or so to Kodachrome Basin State Park. The park earned its name in 1949 from the National Geographic Society with the consent of Kodak Film Corp. The most unique features in the park are the large columns of sedimentary rock that rise from the basin floor, known as pipes. Geologists are uncertain of the exact origin of the pipes that appear somewhat phallic in nature, but at least three theories have been proposed. I like the theory that “the pipes are remnants of ancient springs. The springs became choked with sediments, which eventually cemented together and became more erosion-resistant than the surrounding rock”. The softer rock eventually eroded away exposing the sedimentary pipes. After strolling 1.5 miles along the Grand Parade Trail that winds between junipers along the Kodochrome Basin floor to two different slot canyons, Petey and I took another 1.5 mile trail, Angel’s Palace, which rose 150 feet above the floor and provided views of Kodachrome Basin, Bryce Canyon, and the surrounding area. After visiting Bryce, I’m not certain the backtracking, $6 entry fee, and one hour in the park was completely worth it, but I must say it was distinct. As we left the park, Petey didn’t seem like he was feeling that well, so we sped up our journey slightly in order to be near a town with a vet if necessary. In addition, while my legs weren’t screaming at me, they definitely felt fatigued from yesterday’s 8.5 miles of ups and downs, so the rest of my walks for the day were rather short. On the way back toward Bryce Canyon, which by the way isn’t technically a canyon, I stopped off at Mossy Cave Trail which led me through Water Canyon to a waterfall and Mossy Cave beneath towering hoodoos. Water Canyon, historically a dry wash, is now home to a nearly constant water flow due to the Tropic Ditch. In 1892, pioneers labored for two years to dig a canal, known as the Tropic Ditch, to bring water to the semi-arid valley. To reduce the amount of digging, they planned the route utilizing natural water courses like Water Canyon. The Mossy Cave is “a grotto formed as an underground spring which permeates the bedrock and the water slowly dissolves the calcite that bonds the silts and muds of the Claron Formation”. Much of the year, the water dripping from the cave form icicles. Highway 12 continued east to Red Canyon, also nicknamed Little Bryce. 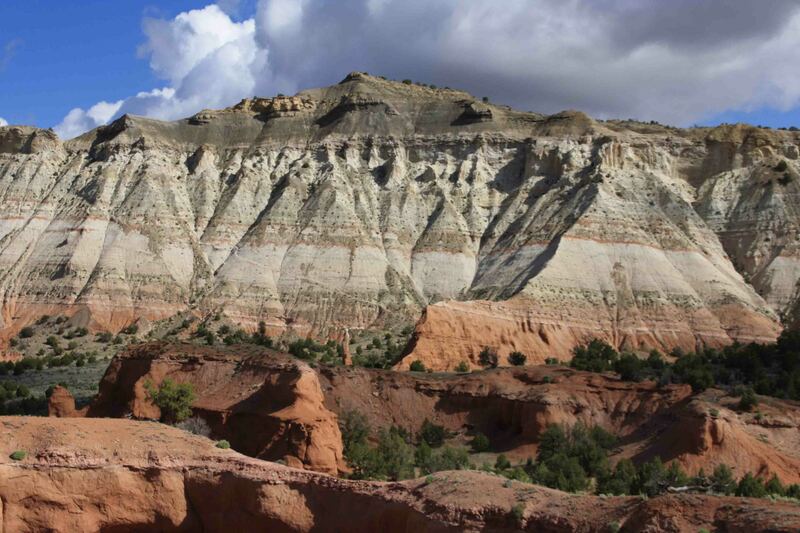 The canyon, located in Dixie National Forest, dons terra-cotta colored walls and was once an ideal hideaway for outlaws. Before I left for another mile amble along the Pink Ledges Trail, I gave Petey an extra dose of Prednilisone in hopes to boost his reduced appetite and energy. Upon return from my stroll among ponderosa pines, twisted stone formations, and a historic 1927 guard station, I was unusually pleased to find my small trash bag strewn across the floor of VANilla. Petey had recovered! From Highway 12, we turned south on Route 89 and traveled about sixty miles to Coral Pink Sand Dunes State Park. Appropriately named, rosy colored sand dunes formed from eroding sandstone adorned the landscape beneath the Vermillion Cliffs and ponderosa and pinyon pines. As I arrived at the park, a dark cloud overhead spattered rainwater on VANilla’s windshield. I decided only to snap a few photos before investigating Zion National Park. I entered Zion National Park late in the afternoon from the east in order to acquaint myself with the area with the full intention of exploring in the morning. Little did I know by entering the park from the east, I was committing myself to an hour drive zig-zagging for 10 miles above Pine Creek and through two tunnels, one a mile long, which were blasted through solid rock in the 1930’s. Had I realized the difference in topography from one side of the tunnel to the other, I probably would have spent a little more time admiring the eastern side of the park and snapping photos. The towering cliffs looked like uplifted shale. Ohhhh I loved the little waterfall.